This week I wanted to show off a PhotoShop project I worked on all on my own! It’s nothing fancy or difficult, but it did involve layers, and I did do it without any aids- books, teacher, cheatsheet, nothing. Just me. Glancing through a book a few weeks ago, my eye was caught by Robert Frost’s poems. I may not like much about American Literature, but I do enjoy his writings. 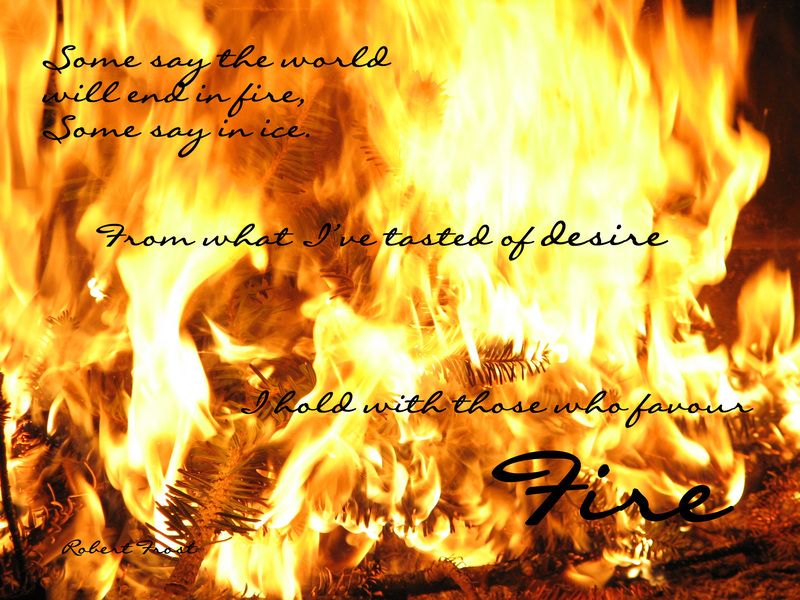 Specifically, I love one of his shorter works, Fire and Ice. It just so happened that I had some awesome fire photos (pyromaniac for the win! ), so I wanted to do something with both elements. I think it turned out really well, but what do you all think? As per usual, click on the picture if you’d like to see it BIGGER. Have a great weekend! 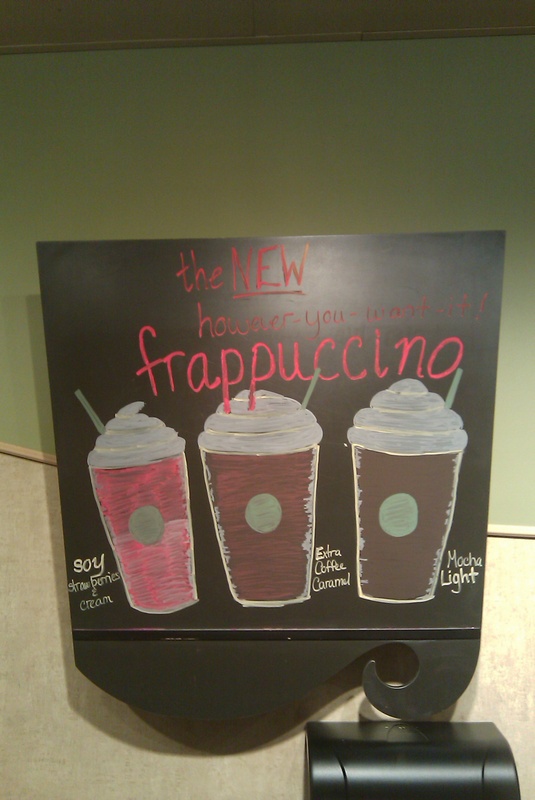 This Tuesday was the official rollout of Starbucks’ new however-you-want-it frappuccino. Many customers have asked us just what is different about the new process, so here we go! The old recipe used to be 3 steps: dispense based (creme or coffee), add in syrups, add in ice and blend. The only problem was that we were pretty much limited when it came to special dietary needs. We couldn’t use soy or be vegan, for example. 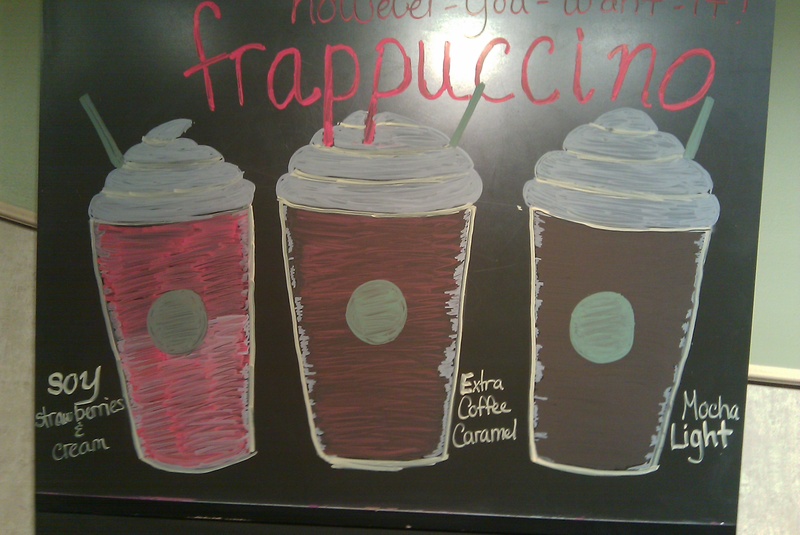 So, Starbucks broke it down for us. If you want coffee, we put that in first- we can even make it decaf! 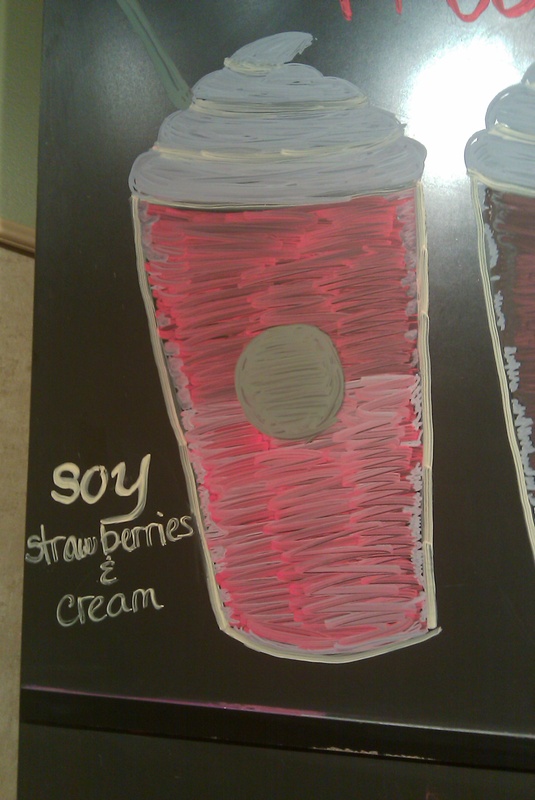 Then, we put in any milk you want: soy, non-fat, 1%, 2%, whole, breve, heavy whipping cream, anything! If you want flavouring we put that in next- any syrup, any add-ins, any combination. The last ingredient we put in is the magic; it’s a thick binding liquid that gives it that great consistency and frappuccino taste. Okay, now for the fun stuff! 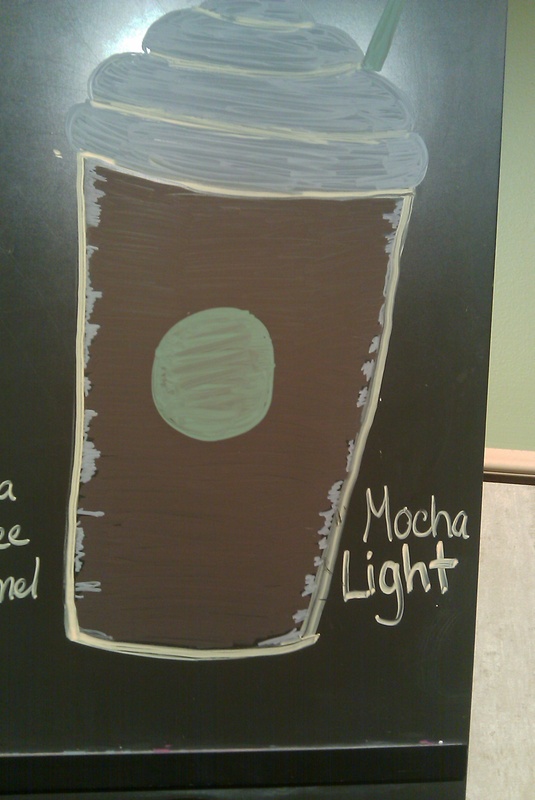 Because our normal store artist wasn’t working the night before rollout, yours truly had the opportunity to do the store’s main chalkboard. That’s right- my first promo board! 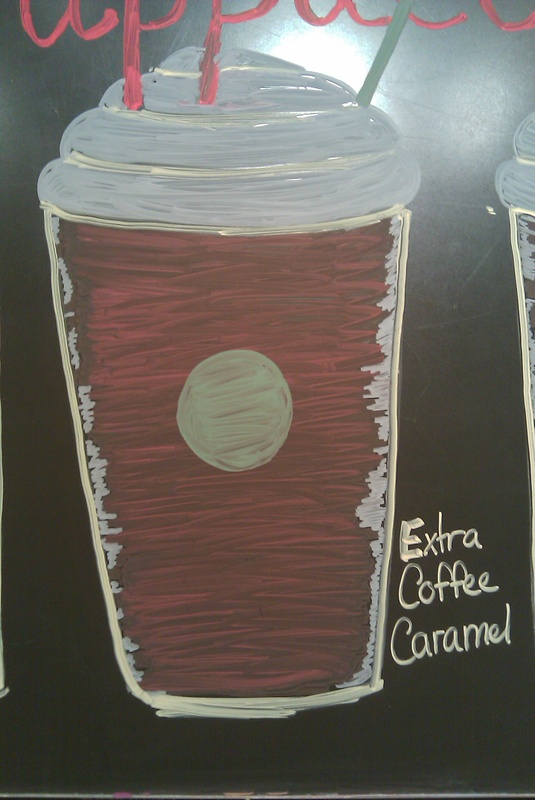 My District Manager even complimented our Store Manager on it. Here are some of the first pictures- I’m hoping to get some better ones of the updated board. Yes, I tweaked. How could I not? I’ll post some more pictures soon! So, now to the explanation of this blog title. Starting yesterday, and running through May 16th, you can come in from 3-5 pm and get any frappuccino in any size for half off! 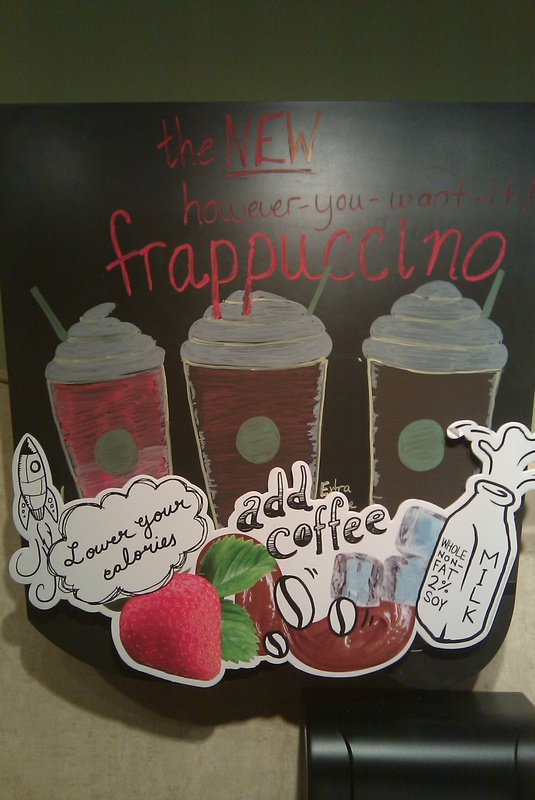 Mum and Dad came in to visit during “happy hour” and Dad called it, “frappy hour.” Now, it stuck (and it’s part of the improvements I made to the board). As a last note, we have new coffee gear! We love our cute, new, blue aprons (pic of that to come too). However, the wrist bands are a little puzzling. In case you have sane baristas who refuse to wear them, here’s what they look like. There’s no consensus as to why we have these. They are a health hazard, being so close to so many contaminates. We’ve compiled a list of possible reasons for the wrist bands. 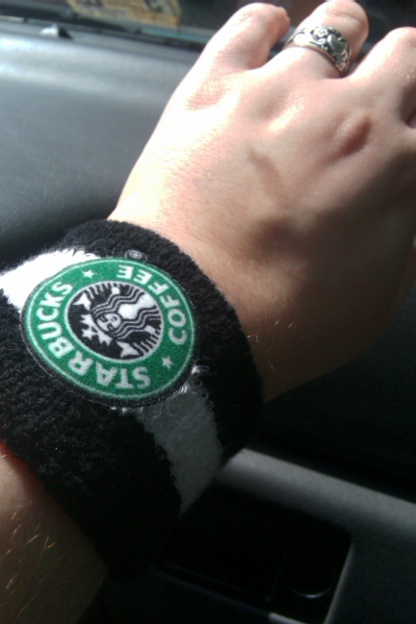 Let’s have some fun and try a poll: why do you think that Starbucks gave us these wristbands? Pick your top three, or suggest your own ideas! Well, that’s all from me for now- I’ll be back with more pictures and stories of this crazy week very soon. Stay tuned, and thanks for reading!